Home Latest News LOUIS XIII a look into the future! LOUIS XIII a look into the future! "BEVERLY HILLS, CA - NOVEMBER 18: Louis XIII Cognac is displayed at Louis XIII Celebration of "100 Years" The Movie You Will Never See, starring John Malkovich at a private residence on November 18, 2015 in Beverly Hills, California. (Photo by Charley Gallay/Getty Images for Louis XIII)"
They say good things take time and if LOUIS XIII Cognac isn’t testament to that statement then I don’t know what is. Just consider the fact that it takes a century to make the cognac and you’ll understand why. So if you’re like us and you can’t wait to see what other great things the future holds, then you’re going to love the new activation put together. Read on to gain more insight on one of the world’s most luxury brands and a movie that you will never see. To perfect one of the world’s finest cognacs and most luxurious spirits it requires one hundred years and four generations of Cellar Masters’ blood, sweat, tears- but most of all, patience. The ultimate legacy that is LOUIS XIII all began in 1569 when one simple flask was lost on a French battlefield. Some three centuries later in 1874, Paul-Emile Remy Martin unearthed the flask and introduced it to the people as LOUIS XIII. The world has never been the same since. Its grapes grow in the chalky soils of Grand Champagne, the most sought-after area of the cognac region in France. Some 1,200 samples of eaux-de-vie, the youngest of which is 40 years old, go through a rigorous selection process of which barely a dozen are selected to travel the one hundred year long journey into becoming an international icon of luxury. The newly appointed Cellar Master for the House of LOUIS XIII is Baptiste Loiseau, whose infinite dedication to the spirit he will never taste is immeasurable. His age-old role is to select and blend the eaux-de-vie using his keen sense of smell, creating the unique combinations that will one day be used by his successors to compose the final blend which will evoke aromas of myrrh, honey, plum, honeysuckle, wood bark, leather and passion fruit. 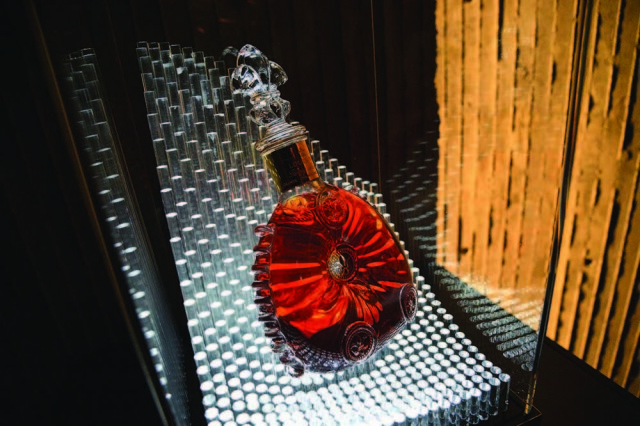 The core values in LOUIS XIII are immediately identified in the patient craftsmanship of the decanter. The ancient metal form proves that the exceptional cognac stays true to its timely history. Some 60 years after its introduction to the world, crystal took the place of glass and it is this handcrafted execution that the world knows and recognises today. The design is a potent symbol of the French art de vivre and an exact reflection of the vision that Paul-Émile Rémy Martin had centuries past. For more than a century LOUIS XIII has been, and continues to be selected to mark significant moments – events, personalities, styles. LOUIS XIII represents the very vision of luxury and a pleasure that will continue to transcend for centuries to come. On November 18, 2015, inspired by the century of careful attention and patience it takes to create each decanter of LOUIS XIII cognac, the brand announced an original film written by John Malkovich, which envisions earth one hundred years in the future and will not be released until 2115. Launching the futuristic film directed by Robert Rodriguez, “100 Years: The Movie You Will Never See”. The film is a theatrical depiction of an extraordinary event happening in real life; a single decanter of LOUIS XIII has been locked inside a custom-made safe that only opens automatically when the timer goes off in one hundred years. The safe contains the one and only copy of the film there is. World-leader in secure storage, Fichet-Bauche, a distinguished French brand, today owned by Gunnebo Group, a worldwide leader in security products, spent hundreds of hours of designing this unique system. “We wanted a safe box that can be opened like never before: with nothing else but time. Once the door is shut, the countdown begins and there is no way of opening it until the one hundred year countdown is complete on November 18, 2115. Since the system that could guarantee we hold our promise didn’t exist, we invented it,” said Ludovic du Plessis, Global Executive Director of LOUIS XIII. Staying true to the patience it takes to create one decanter of LOUIS XIII cognac, the film will not be released for another century and will envision earth one hundred years in the future. Together, the film and the cognac transcend the march of history and will for centuries to come. Du Plessis was joined by an array of influential celebrities, tastemakers and business luminaries to celebrate the cinematographic project in London on Tuesday 2nd February. The safe arrived ‘safely’ in London after it’s global tour, stopping in iconic places such as L.A. and Hong Kong, to celebrate the film and preview an exclusive trailer. Guests were also invited to experience a glass of Louis XIII while witnessing an exclusive interview with du Plessis. One thousand guests worldwide received an invitation to give to their children, their children’s children, and so on, to attend the premiere at the House of LOUIS XIII in Cognac, France in the year 2115.